When Christopher Columbus discovered America back in 1492, he did more than open a gateway for millions of Italians to pass through several hundred years later. He changed the world. This is the story of one of those changes. It’s the story of a street, the Via Garibaldi in Genoa, Italy. October is Italian Heritage Month. 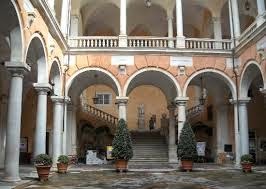 CHIAVARI, Italy – The Via Garibaldi is a wide, straight street of opulent Renaissance palaces in the Mediterranean sea port town of Genoa, Italy. The fifteen palazzi on this street are all elegance and architecturally artistic on the outside and sumptuous and lush in their interior décor. Magnificent salons are hung with drapes of plush velvet and hand woven silks and made bright by delicate hand blown Venetian glass chandeliers. 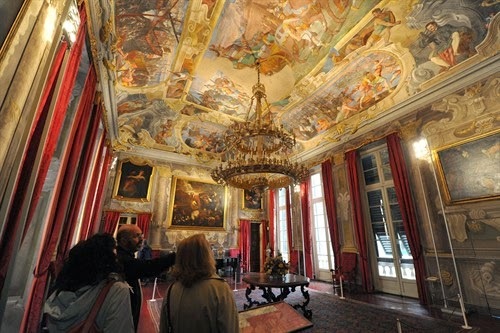 Ceilings hold painted frescoes that speak of love and war, myths and legends while flickering candles send sparks of light bouncing off gilded cornices and mirrors encased in burnished gold leaf. 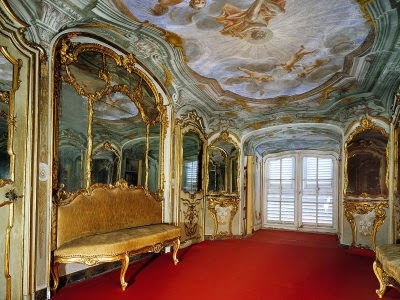 The palazzi were built during a time of extravagance and excess, a capsule of time captured between the mid 16th and 17th centuries, a time known as los siglos del los Genovese - the Century of the Genovese. It was a time of change. A New World had been discovered and there was excitement in the air. The royals of Europe were tantalized by the lure of new lands to conquer and the riches that awaited them, including the Holy Roman Emperor, King Charles V of Spain who was one of the first to send explorers to the New World. He was not worried when Spanish sea captains polished their compasses and quadrants, raised the sails of their wooden ships and set out on poorly charted seas. After all, if Christopher Columbus could cross the ocean without falling off the edge of the world, then anything and everything was possible. The race for gold and glory was on. But fitting ships and paying sailors costs money, money that the Spanish king did not have. So he turned to the wealthy bankers of Genoa who were more than happy to finance the Spanish explorations, just as they had done for Portugal. It wasn’t long before the Genovese became the official bankers to Charles V and his Spanish court, and Spain’s New World wealth began finding its way to Genoa. It is estimated that about 45 million escudos (equal to 400,000 lbs of gold) in interest charges were paid to the Genovese bankers in the twenty year period between 1614 and 1634. But the bankers were not the only ones profiting from the fever of New World explorations. The port of Genoa was overflowing with exotic goods like tobacco and tomatoes, slaves and sugar coming in to be traded and sold to eager European markets. Genovese merchants and shipbuilders, as well as the bankers, grew even richer. It wasn’t long before they became the Republic’s new ruling class. It was then that they decided they wanted an exclusive, private street of their own, a safe street where their families could walk in the evening free of the dangers that lurked in the dark alleys of the old city. They also wanted a street that would send a clear message to the world of their newly acquired power and wealth. It would be called the Strada Nuova, the New Street. They chose an area along the uppermost edge of Genoa’s congested old city and set about razing the existing neighborhood. The first ten palazzi on the street were being built by five of the city’s most powerful families, the first of which was Agostino Pallavicino, the ambassador of Pope Paul IV. Agostino’s brother Tobia, a merchant known as the “King of Alum”, would build across the street. One by one the plots of land were claimed: five for the powerful banking family of Spinola di Luccoli, one for banker Nicolosio Lomellino, another for Nicolo’ Grimaldi, the personal banker to the King of Spain and a distant relative of today’s Grimaldi royals of Monaco. And last but not least, one plot for banker Franco Lercari, nicknamed ‘ il Ricco” the Rich. 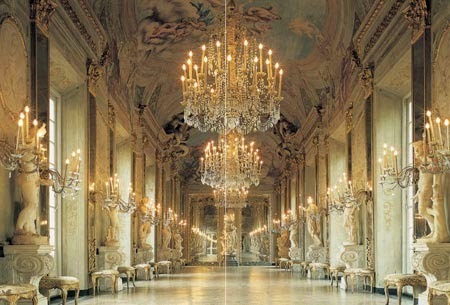 Both inside and out the palazzi were transformed into masterpieces of art and architecture. Famous artists were brought in to create portraits of the owners and their families. Walls and ceilings became flights of fancy with earthy frescoes of sword wielding heroes battling evil, and lunettes of hand holding chubby faced putti perched on billowing clouds and framed with burnished gold. Floors sparkled with mosaics transformed into works of art with tesserae of majolica or glass, pebbles, crystals, shells and slivers of coral in explosive colors and intricate patterns. It was enough to make even the most sophisticated visitor’s head spin. Kitchens were state of the art, modern and progressive. Gone were the smoky old fashioned fireplaces of the past, the kitchen help in these palazzi had built-in bread ovens and stoves with which to cook the owner’s food. But the most awe-inspiring rooms of all were the bathrooms. 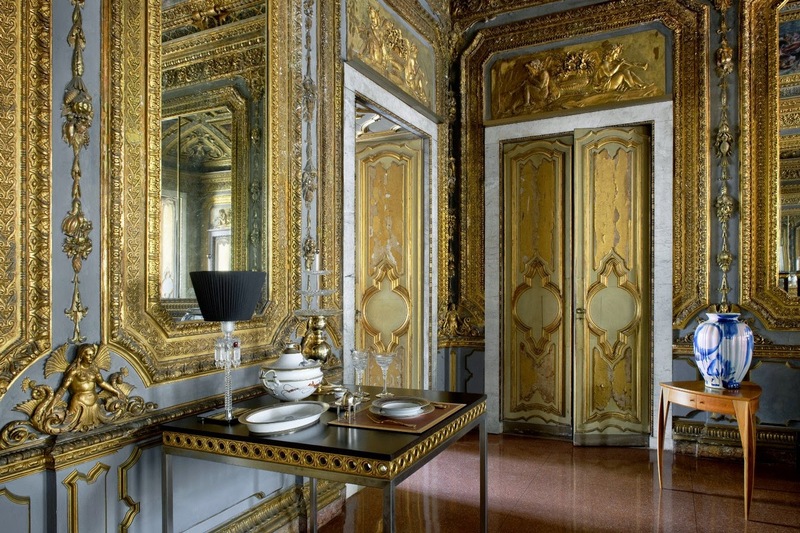 As most toilets of the time were simple wooden covers over a hole in the corner of the kitchen that emptied into an open pit below, it is easy to understand why architect and artist Giorgio Vasari was so bedazzled by the bathrooms, especially those in the palazzo Pallavicino. Not only were they big enough to hold ten people, but they had pedestal toilets and water basins with hot and cold running water. 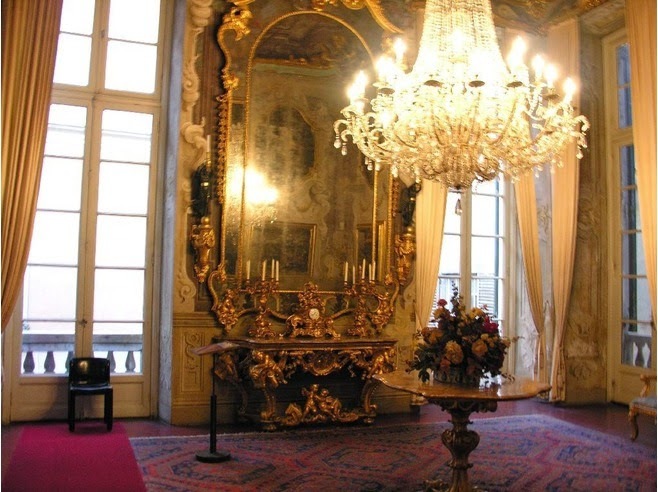 As there were no official State properties like the White House or England’s 10 Downing Street in which the Genovese government could host and entertain visiting dignitaries, the Republic of Genoa had come up with a unique system of hospitality; they used private residences. 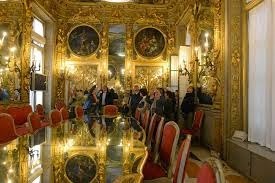 Records found in Genoa’s secret State archives show that in 1576 all of the palazzi on the Strada Nuova had become part of the Republic’s hospitality system and duly recorded on special hospitality lists called Rolli. Each Rollo was categorized and rated by size, beauty and the owner’s social position. The categories were called bussoli and seem to be the precursor of the star rating system we use for hotels today. The palazzi in the highest ranking category, the first bussolo, were reserved for reigning monarchs, princes, cardinals and viceroys. Those in the second bussolo hosted governors and important land owners, while palazzi in the third bussolo were reserved for ambassadors and princes of lesser standing. When artist Peter Paul Rubens visited Genoa in the early seventeenth century he was so impressed by what he found he published a book: Palazzi di Genoa – Architectural Drawings and Engravings (First Edition: Anversa, 1622). The book featured full page engraved illustrations of the exteriors and interiors of the palazzi including sketches of the unusual hanging gardens and a description of every new idea, both functional and decorative. As word spread, visitors from far and wide came to see the street for themselves. It was the wonder of Europe and before long almost every royal palace and residence in Europe had adopted one or more of the innovative ideas taken straight from the palazzi on the Strada Nuova. In the early 1990’s, when I first lived in Genoa, the street had been renamed Via Garibaldi and some of the palazzi still bore gaping wounds from the damage suffered during World War II. But that soon changed as the palazzi, and the city, were made ready for the big 500th year Columbus Day celebration in 1992. If you walk down that street today what you will see are the palazzi just as Rubens saw them. Actually the only thing that has changed in the centuries since he was here is the name of the street. And to think it all started with Christopher Columbus. What a fascinating post. Now I really must visit Genova. Grazie mille.